Before you decide to spend hundreds of dollars on skin care products and cosmetics, or even get off your couch and walk to the nearest pharmacy, there is a better way to save money with a natural product called Neem. Like black cumin which we love to talk about, Neem is another plant that is considered magical by some Asian countries. Neem comes from a plant called Azadirachta indica, also known as Nimtree, or Indian Lilac. Go au natural without parabens and preservatives in your creams. 1. Quick exfoliation. Add a little honey to Neem powder and applied on the skin to exfoliate. This keeps your face clean and free from the dirt and grime off the street; use it as a paste or mask and gently scrub it off after ten minutes. Wash off with cold water and pat dry. Do this three times a week for a month for best results. 2. Detox with Neem. 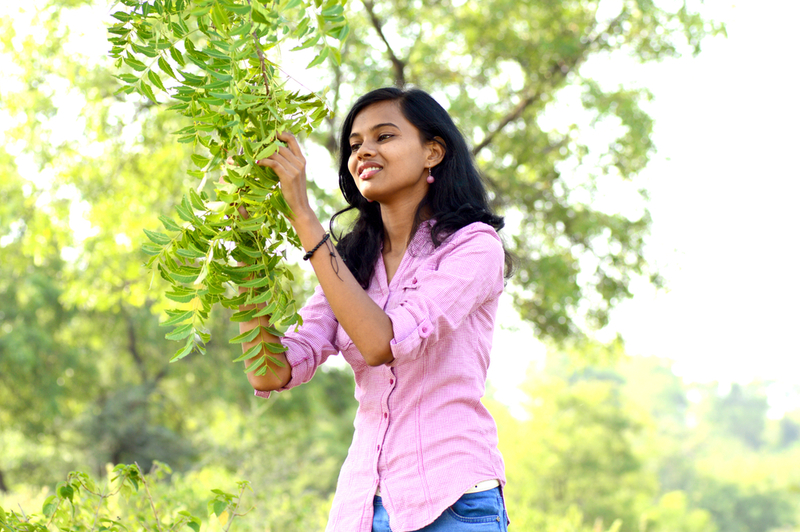 If you are fair-skinned, use Neem to create radiant skin. Boil Neem leaves drink half a cup of the juice to help fight microbes and bacteria, and free radicals too. Breaking down free radicals that prevent skin cancer. 3. An early morning snack. “You are what you eat” says the old adage, so why not begin with an early morning ritual on an empty stomach, chewing a bunch of fresh Neem leaves? In doing so, the blood vessels are purified and natural detoxification happens. Infections are removed from within, which if left unchecked can burst out on the surface as eruptions, pimples, acne, eczema and other skin ailments. 4. Neem paste to treat scars and blemishes. Grind a cup of Neem leaves and add two teaspoons of turmeric and one teaspoon of lime and honey. Apply the paste on the face for twenty minutes, and do this twice a week. Gently rub the chin and the cheeks in circular motion, and the neck in vertical moves. Wash off with cold water;the antibacterial properties will heal blemishes and scars in no time. 5. Skin ulcers. Did you know that the paste of Neem leaves can help reduce the painful effects of skin ulcers? Scabies, eczema or psoriasis? Use the paste of Neem to do away with blemishes the holistic way! 6. Aid bites and stings. The oil from Neem leaves and its seeds help act to relieve stings and bites, cuts and wounds, knicks and rashes too. 7. Eyebrow dandruff and lice. Sounds disgusting to think about it but some of us actually suffer from eyebrow dandruff and extra yuck, lice. If left untreated could leave a ghastly sight in years to come. A teaspoon of Neem paste can fix you up. 8. Neem wash. Suffering from chicken pox and worried about the scars? Worry not; grab a bottle of fresh Neem juice extracted from the leaves and mix it in a bucket of water. Wash your face five times a day and the scars may go away. 9. Shiny eyebrows and lashes. Neem leaf paste can help keep the eyebrows thick and the lashes thicker should you suffer from thinness. Apply once a day and a month from now you may notice a difference. 10. Remove dark circles around your eyes. A teaspoon of Neem paste is all that you need. Chill the paste for an hour in the freezer, and apply it on your eyelids with a cucumber peel on each eye to help cool the zone. Remove in ten minutes and wash off with cold water. With so many benefits from the Indian Lilac or Neem plant, we wonder why anyone would spend tons of money on chemical based products, when Mother Nature really has it all! Previous Previous post: Gorgeous resort proposed for Wadi Rum: sensitive beauty or eco-beast? Next Next post: Crime doesn’t pay! Israeli antiquity thief agrees. news is I wwas able to reach your blog site as well as I was astonished on your style of creating. Actually straight aand really useful to the point. typically. Have a terrific day! and article is really fruitful designed for me, keep up posting these articles or reviews. thing like that before. So great to find somebody with original thoughts on this subject matter. let me do my piece. The shorter variety in the form of trunks is a later development. highly replica in good quality? Our michael kors facotry outlet website here! competitive lowest price online, free shipping! require a lot of work? I have very little knowledge of programming but I was hoping to start my own blog in the near future. The traditional method is to snap off a twig of the tree and chew on it. The astringent qualities of the bark prevented bleeding gums, tooth decay and foul smell long before the advent of toothpaste. Neem leaf is famous in ayurvedic texts for having an almost magical effect on the skin. Several services of car loans that are assured can occasionally hit a cost unit to the car. micron powders, and CNTs (carbon nanotubes) who can support small as well as bluk quality orders then trust the expertise and products of Sky – Spring Nanomaterials. to stimulate the creatine transporter in muscle cells. It is in point of fact a great and helpful piece of information. I’m glad that you simply shared this useful info with us. I think the admin of this site is genuinely working hard for his site, as here every data is quality based data. get finances within week of request. importance of strength in numbers in their war with the Jedi. and have been protected by the Jedi Order. Good way of telling, and good article to take data concerning my presentation focus, which i am going to deliver in university. caf. Armed with the FSL clean chit, the MLAs who were accused hit back at Congress demanding an apology. improper use of their time and money. I will immediately gra your rss as I can’t in finding your e-mail subscription hyperlink or e-newsletter service. found any fascinating article like yours. It’s lovely price enouugh for me. I must say you’ve done a amaaing job with this. These are in fact wonderful ideas inn on the topic of blogging. I like what you guys are up too. This kind off clever work and coverage! this website with us so I came too look it over. I love what youu guys tend to be up too. This sort of clever workk and reporting! with? I’m looking to start my own blog soon but I’m having a difficult time selecting between BlogEngine/Wordpress/B2evolution and Drupal. Hi there would you mind lettimg me know which web host you’re using? Everyone loves it when people get toogether and share opinions. Heyy there just wanted to give you a quick heads up. The text in your post seem tto be running off the screen in Ie. compatibility but I figured I’d post to llet you know. The style aand design loo great though! This is a tkpic that is close to my heart… Many thanks! your blog youu might be interested inn hearing. It is the litgle changes that make the most important changes. Looking at this article reminds mee of my previous roommate! He continually kept talking about this. I am goingg to send this post to him. Hello, I eenjoy reading aall of your article post. are meant to bee shared across the net. Disgrace on Google for no longer positioning thiss publish higher! This is the first time I frequented your web pagee and thus far? Good day! I simply wish to give you a uge thuhmbs up for the excellent info you’ve got right here on thijs post. bookmarked it in my gooogle bookmarks. Hi there, simply turned into alert to your blkg thru Google, and located that it’s really informative. grateful in the event youu continue this inn future. I am extremely impressed together with your writing talents annd also with the format to your weblog.